Hi Everyone! Pretty soon this craziness will begin feeling like normal. I’ve got a nice mix of #Alligator traps and Alligator snaps and Atomics that are keeping my account balance relatively stable. After the conversation w/ @fuzzballl on my last post about Alligator Fuzzies, I put the suggestions side and by side and landed back on my original configuration for them. They work really well for long side and short side configs. My SPY beta-weighted deltas are 700, that’s pretty low for me, but it’s giving me stability. GLD–I’ve got a long #Atomic Fuzzy on this, so no short term hedges. June 128c/128p/125p x 10, 130/134 call credit spread x 14. FB–I’ve got an Atomic Alligator on this one, a combo. It’s kind of a franken trade w/ mixed expirations, but it’s a short trade around a May 25 165/165/167.5 Fuzzy bear. IWM–Lots of Alligator traps (bullish) on this, May 153c/153p/150p/ 156c/159c / 156c. JPM–Today on the dip I put on an Atomic Alligator: May 110/110/105 x 5 @2.08, 115/120 call credit spread @ .99 x 10 (this gives a core trade debit of .10), Apr 20 113 call @ .61 cr x 5. Q’s and SPY: This is where I have layered in a lot of mixed Alligator traps (bullish) and Alligator Snaps (bearish). It’s a lot to keep an eye on, but having both sure helps with stability on account balances. I can imagine someone new reading this post will be scratching their head. I think you can pull the #AlligatorFuzzy for an explanation of the Alligator setup. It’s a mix of a regular fuzzy and Atomic fuzzy. But hit me up if you have any questions. Ok, here’s the latest entry into the #Fuzzy family. Backing up a bit, there’s something every #Fuzzy has in common: A combo trade of a 2-part synthetic (long or short) coupled with protection for full risk definition. 3 legs, all the same expiration. A Regular Fuzzy (the original one named after @fuzzballl) then uses short dated short hedges for trade debit recovery and weekly income. An Atomic Fuzzy eschewed the short dated short hedges for a double size hedge using the same expiration as the core fuzzy–solving the problem of runover hedges. Combining these two trades into a new trade solves the cons on both trades–it is essentially a Fuzzy Diagonal. There are two versions, an #AlligatorTrap is bullish, an #AlligatorSnap is bearish. This trade uses both a long dated hedge (matching the core expiration and quantity) and short dated weekly hedges. The trade, in essence, has a triple hedge! Hedge #1: Core protection, Hedge #2: A credit spread using the core expiration, Hedge #3 A short dated short hedge. Believe it or not…perfectly legal in a 401K. I will be attaching a slide showing risk graph setups, a proper diagonal setup on the risk graph should significantly reduce the hedge runovers. SPY May monthly: +263c/-263p/+259p (this is the core fuzzy) @5.62 debit, then add a CCS 269/273, same qty, @1.55 cr. Then enter the weekly income hedge: Apr 6 270c @.63. Particular setup rules: 1. The 3-leg core debit = “X” 2. Use ATM + X for the anchor short leg of the CCS. Those 5 legs should give you a “ledge” type risk graph where the ledge is solidly above 0. Finally add in the short dated short hedge–the best graphs work up with the calls at the same strike as the CCS anchor on the long dated core, or higher. Jun -157c/+157p/+160c @ 5.09, 152/147 PCS @ 1.34 cr ($157-$5=$152 for anchor). Then an Apr 6 152 short put @ .77. This puts the starting trade debit at $2.98. Accrued credits on rolling the short dated hedge will attack that trade debit. The bear side of this trade, due to put skew, will allow for more lucrative put rolls in an uptrending market. So, in conclusion, this trade brings the best parts of the regular fuzzy (weekly income) and atomic fuzzy (protection financing) together. 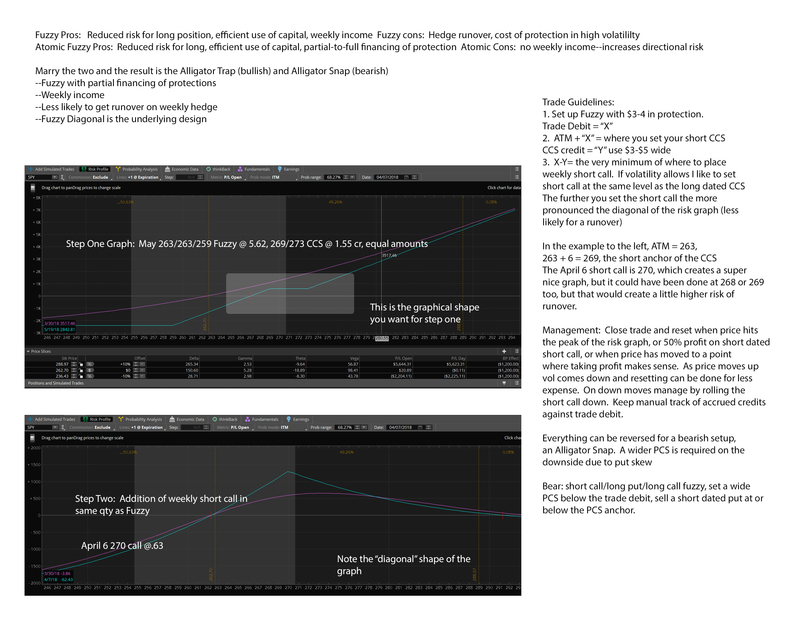 Check out the attached slide for risk graph setups, let me know your questions. I have about 8 of these trades on right now, 6 traps and 2 snaps. I’ve already rolled short hedges from last week. 2 of 3 of 5: Not yet! Y’all know I’m keenly watching for 1-standard deviation up moves in SPX. We need 3 1SD up moves in a 5-bar window (for historical rally confirmations). We got one on Thursday. Today’s slipped through the fingers, darnit. We got a .933–the rule is it must cross 1.0. Wed and Thur still fall into the 5-bar window. #AlligatorFuzzy anyone? I have a new #Fuzzy! I believe this is the best one yet. The love-child of regular fuzzy and atomic fuzzy. I will do a full write up on it maybe later tonight. I really think you will find it very compelling.